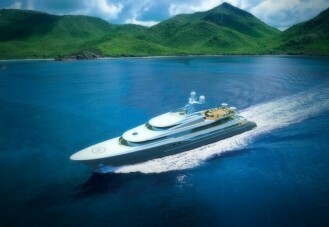 Luxury motor yacht RED SQUARE is a 72m steel superyacht to be built by Dunya Yachts, based in Turkey. This impressive yacht was designed by Diana Scott from the dynamic Monaco based design studio, Sterling Scott. Interior design is by Alberto Pinto. Associated with Edmiston and due for delivery in 2010 this 72m mega yacht will accommodate up to 16 guests in complete luxury. She will offer an infinity pool, spa pool and two helipads. RED SQUARE has huge exterior space and entertainment areas and a cruising speed of around 16 knots.